Mr. T, whose real name is Laurence Tureaud (born May 21, 1952) is an American actor. He is famous for playing Sgt. Bosco "B. A." Baracus in The A-Team and James "Clubber" Lang in Rocky III. 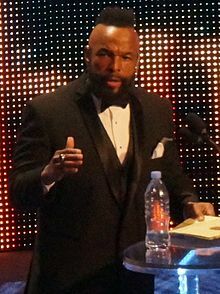 Mr. T has a popular catch phrase, "I Pity the Fool", which lead to the name of a reality television series he appeared on. He also had a comic series called Mr T and the T-force. Mr. T is known for having a mohawk hairstyle and wearing a lot of gold jewelry. Tureaud was born in Chicago. Before he became an actor, he was a bodyguard. Mr. T is a born-again Christian. Tureaud made his neighbors in a Chicago suburb called Lake Forest angry. He cut down more than a hundred oak trees on his estate. This is now called "The Lake Forest Chain Saw Massacre". He gave up almost all his gold, one of his identifying marks, after helping with the cleanup after Hurricane Katrina in 2005. He said, "As a Christian, when I saw other people lose their lives and lose their land and property...I felt that it would be a sin before God for me to continue wearing my gold. I felt it would be insensitive and disrespectful to the people who lost everything, so I stopped wearing my gold." 1983 Alvin and the Chipmunks Himself Episode: "The C Team"
1999 Malcolm and Eddie Calvin Episode: "The Wrongest Yard"
2003 House of Mouse Himself Episode: "House Ghosts"
2004 Johnny Bravo Himself Episode: "T is for Trouble"
2004 The Simpsons Himself Episode: "Today I Am a Clown"
↑ Dunn, Brad (2006). When They Were 22: 100 Famous People at the Turning Point in Their Lives. Andrews McMeel Publishing. p. 150. ISBN 0-7407-5810-1. ↑ "Words of Wisdom from Mr. T". Beliefnet. Retrieved 2007-11-22. ↑ Johnson, Dirk (May 30, 1987). "GENTEEL CHICAGO SUBURB RAGES OVER MR. T'S TREE MASSACRE". Retrieved April 28, 2012. This page was last changed on 7 October 2018, at 16:47.